We google "best video compression software" for various reasons. You have a Creative Webcam 750 and plan to send some family videos by email but find any video taken is much too large. You create a 2-hour movie in MP4 using HitFilm and mean to stream it via Vimeo or YouTube, yet you suffer a failure on account of its 7 GB large file size. You may wanna compress a video on Mac in HD 1080p (about 10 GB) to the minimum size without sacrificing any quality, but no suitable Mac video processing software reaches your expectation. * Bad quality: The shrinker gives me a highly condensed file, but the quality is not as good. When I import the video with mpeg-4 codec in 1080p, I already lose tons of quality. Any software can reduce video size without sacrificing video quality? * Compression ratio is not enough: I have a 9GB video and I need to reduce it to the smallest size as possible. I can significantly downsize its file to around 4.27GB at good quality, which is impressive, but still too large for me. If I go further, the video quality becomes unacceptable. How can I properly reduce the video file size to smaller size without much loss in quality? Any compressor suggestion? * High CPU usage: When I downsize a 4K ultra high-definition video with Handbrake, my CPU runs at 100% and computer gets hot. When I set the priority to lower settings to ease the CPU usage, the video shrinking becomes very slow. >> [Tips] Video compression settings tips. Best Video Compressor for Mac - Quality Comes First! Compress large-sized 4K ultra HD, Full HD 1080P, 720P videos in HEVC H.265, H.264, MP4, MOV, AVI, MKV, to FLV, WMV, etc. small-size videos for emailing, uploading to YouTube, Facebook, playing on iPhone iPad Android with several GBs reduction. Apparently, the best video compression software for Mac should hit the sweet spot between final video size and output quality, yet without producing too much burden on CPU if downscaling 4K ultra HD videos or higher resolutions. Which is the second-to-none video compressor for Mac you need? 1. Its built-in High Quality Engine and quality adjustment slide bar are specially designed to guarantee up to 98% output quality. 2. And its hyper-threading tech enables multiple threads to run on each core and multi-core (up to 8) CPU utility assigns the whole video compression to multiple cores. 3. Plus, this Mac video converter is the world's first converter to arm with 3-Level Hardware Acceleration, namely Intel QSV, Nvidia/Cuda, AMD APP in copmressing. The unique features deliver 5x faster speed than its closest competition when resizing any videos, even 4K UHD clips while without placing any burden on CPU. Step 1: Free download this stellar video compression software on Mac, launch it and click "Add File" to load the video files you want to downsize. Step 2: Choose the output format. This software will compress MP4, AVI, MOV, WMV, etc for smaller size. You can select a smaller output format like HEVC H.265, H.264, FLV, WMV etc. 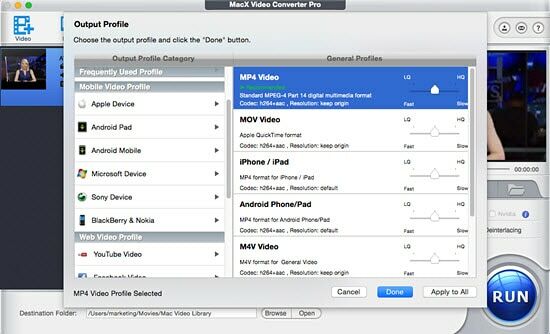 Here we transcode video to H.264 in MP4 format, choose "to MP4" as your output format. Step 3: Make the following adjustment if necessary. Click the "Browse" button to choose the destination folder. Afterwards, press "RUN" button to start to shrink video file size on your Mac. 1 If you're compressing a large video file to mobiles, here are 350+ readymade profiles for mobiles, meaning you can compress video to iPhone iPad Android with small file size and high quality in one click. 2 Click the icon to edit the video where it is allowed to crop the black bars, remove commercials from video/movie and freely set up the Start Time/End time to get favorite clips, in such a way the video file will be downsized with nary a quality loss (no video conversion involved). 3Click the icon to adjust the video parameters, like Resolution and Bit Rate to make your file smaller. Generally, frame rate and frame size don't much affect the file size. Keep read on the Tips & Tricks below to know more information about how to adjust the video compression settings. * You're suggested to go to Web Video Profile column, here ready streaming video formats like FLV, 3GP, WMV, etc are available. These formats are specially set for uploading video to website barely with the samllest size yet the highest possible quality. * As the best yet multi-purpose video size converter, MacX Video Converter Pro can accomplish this task like a cork. With over 420 preset profiles, this fabulous video compressor for Mac is capable to make video size smaller (MOV, MP4, MKV, 1080P, 4K, 8K) so as to upload to Facebook, Vimeo and YouTube supported video format with the ready-to-use profiles offered. 1. Compress video to the recommended video formats like HEVC H.265(recommended), H.264, MOV, M4V format, as they are smaller than other video formats with good quality. 2. Properly adjust or lower the video/audio resolution (you're allowed to downscale 4K to 1080P, 1080P to 720P, and 640*480 also recommended), and lower the video/audio bit rate by 20-50% compared with its default one. Normally, the smaller video you want, the lower bit rate. 3. Adjust the slidebar of LQ-HQ or click "Use High Quality Engine" in the advanced setting area to improve your compressed video quality. 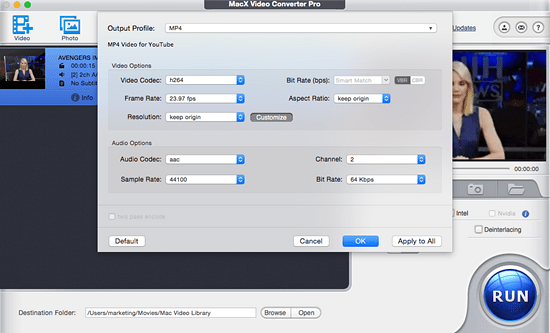 Tip: Have ever seen such a perfect HD video compression software for Mac? If no, have a shot on this amazing video resizer for Mac. It will also surprise you at its awesome 2-in-1 knack to download and convert any YouTube video in a flash. More stuff like, record on-screen video, make photo slideshow video and edit video, whatever you throw to it, it can do that favor for you seamlessly with zero efforts. If you don't want to download programs on computer, you can upload your video and reduce the size with the online video shrinkers here. If you aren't satisified with the output quality or uploading speed, you can try the program here. Choose your way. Seek for a reliable solution to reduce the size of MP4 for uploading to YouTube or send via email? 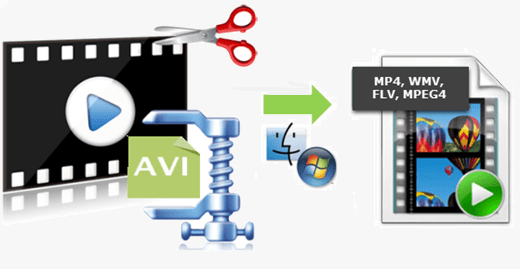 MacX MP4 video resizer can downsize MP4 file to a small-sized FLV, WMV, MOV, etc, change parameter settings and trim unwanted part to make your MP4 file smaller with no quality loss. This guide shows you how to freely change video resolution, e.g. from 4k to 1080p, 1080p to 720p, etc for better playback on your iPhone iPad Android without losing quality. Just download free video resolution converter and compress video with high resolution to smaller size. 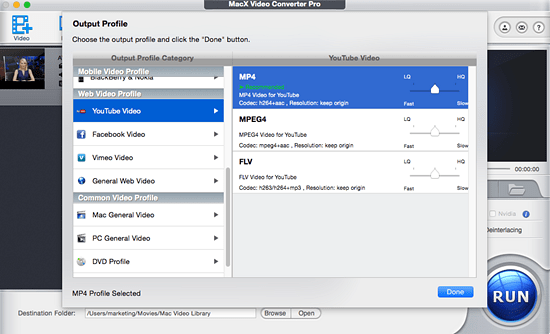 MacX Video Converter Pro is the Mac world fastest video compression software. It enables Mac users to downsize videos to files with smaller size with 5X faster speed than others and 1:1 lossless quality. How to Compress Video on Mac without Losing Quality? Answer is Here!